Our Wonderland Trail hike will probably involve a reasonable amount of snow travel given how early in the season it is and the current record snow levels. I&apos;m noodling on options for extra traction control. YakTrax makes a product that at approx 5 oz straps onto the base of a trail shoe for extra traction. 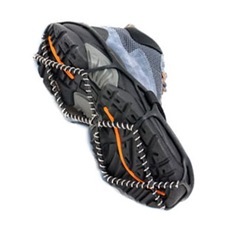 I&apos;m thinking it might not be compatible with the big lug soles of my Golite Sundragons. I&apos;m also thinking it might be overkill to justify an extra 5 oz and poles and caution will be enough to get by with. This entry was posted in Backpacking, Gear Reviews on April 13, 2008 by brett. of snow (!) had accumulated on the top of Bright Angel Trail, wore them over running shoes, (what a beautiful hike!). Wore next winter short hikes on sheer ice, amazingly no slipping, and did not scuff the bamboo flooring where I was staying… mum’s the word.